Last week we were up in Yorkshire again for a short break. Needless to say, we visited some great sites to add to my ever growing list of posts to be written up. The site I’ve decided to write about first is one we’ve already visited three times in past years, and it wasn’t exactly one ‘just around the corner’ from our hotel. Nor was it in Yorkshire. 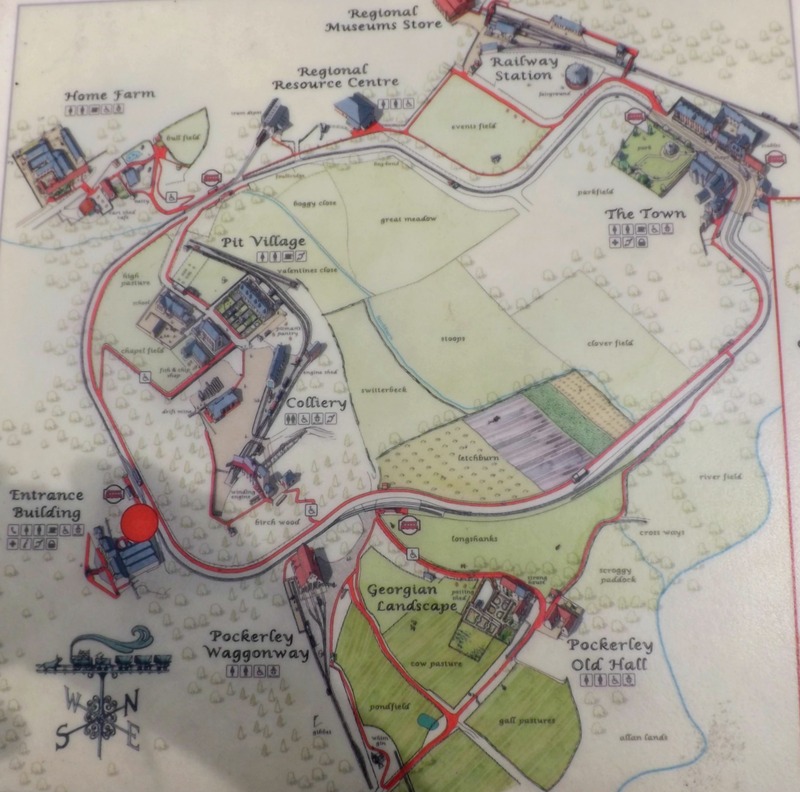 But it’s a great place, with so much of interest to people of all ages., and well worth the 77 mile drive from our hotel near York. So where am I talking about…? Why, BEAMISH of course! The buildings used to create the various areas of the Museum have been collected from across the north-eastern region, the primary aim being to present visitors with a realistic experience of the region’s past. 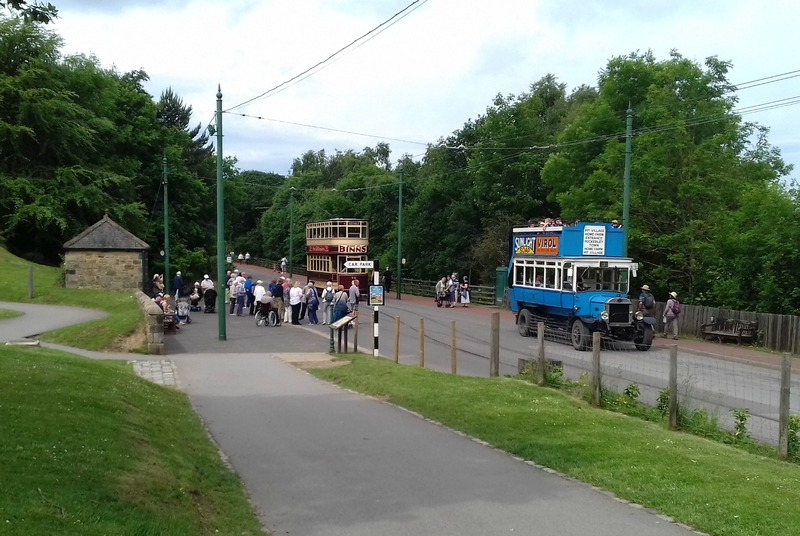 The various areas are spaced out around the site, so a number of trams and omnibuses are available for transporting visitors from one place to another. Most people choose to ride in the old vehicles, some for the experience of it; for others who would find the walking too difficult or just too much, the vehicles are a necessity. Children find them great fun. In fact, on the day we were there, there were several groups of primary children enjoying a day out as the SATs exams had just finished. There were also a couple of groups of older students – all armed with questionnaires – probably studying the Industrial Revolution,or some topic related to one or more of the four sites. At each of the sites, costumed staff and volunteers work hard to bring their roles to life. We can simply watch them carrying out their everyday tasks, or become involved in conversation and learn about the work they do and the goods or produce they are handling. They are impressively knowledgeable as well as helpful. Ravensworth Terrace was built for professional workers and was originally in Gateshead, built between 1830-45. Beamish saved the houses from demolition in the 1970s. The houses were dismantled and rebuilt in Beamish between 1880 -85. On walking along the town’s main street, you can’t fail to notice the Town Park with it’s welcomed greenery. In the 1900s, parks were important places in which townspeople could unwind and enjoy some exercise and fresh air after work in summer and at weekends all year. Sundays would see the many of the community coming together to hear a brass band entertaining them from the band stand. We continued walking along the road heading towards Rowley Railway Station on the edge of town. 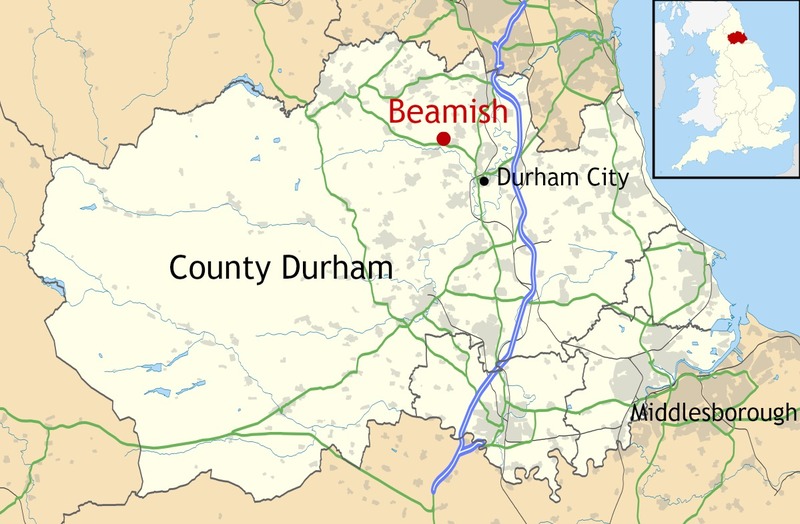 The station was moved to Beamish from the village of Rowley, near Consett, County Durham. The guide book tells us that the North East led the way in the development of the railways. and by 1880, the North East Railway had a network of lines across Northumberland, Durham and North Yorkshire. Rowley Station was built in 1867 and it represents the Edwardian period at Beamish. And to finish Part 1 of my Beamish post, here are a few photos of the Funfair on a field across the road from the station. To be honest, it was by no means the busiest area of the museum. Most people were far more interested in soaking up the history of the place. Dear Millie, you’ve got so many interesting places to visit, amazing. I like the railway station and park sites. Thank you, Ann. We do have rather a lot of historic sites to visit here, and I love these living museums. The staff work so hard to bring history to life – which is what I really love. My husband, Nick, loved the railway station, too. That looks like a very interesting day out. If you can even do it in a day! Enjoyed this and thanks for sharing. Best wishes, MG. Thanks, MG. It was a good day out and a place I like to visit every so often. Your posts are so interesting and varied. Enjoy the day. Mom is doing better and I’m resting as well, had a few hard days. I’m very pleased to hear your mom is a little better. It must be such a worry for you. Keep at your writing, Galit. You’ll get there soon. Editing is something we all have to do! I love the photos of the old buildings and interiors. It reminds me of Greenfield Village in Michigan – one of my favorite places when I was growing up. I’m glad you had fun traveling through time! The Victorian and Edwardian styles are common to us all, and I’d love to see some of the sites over there in the US. Greenfield Village sounds lovely! I imagine the buildings and their interiors have much in common with those over here, Buildings of that time had a certain grandeur that can’t be seen in later periods. Thank you, Sheila. What a great find. Thanks so much for introducing me to Beamish. 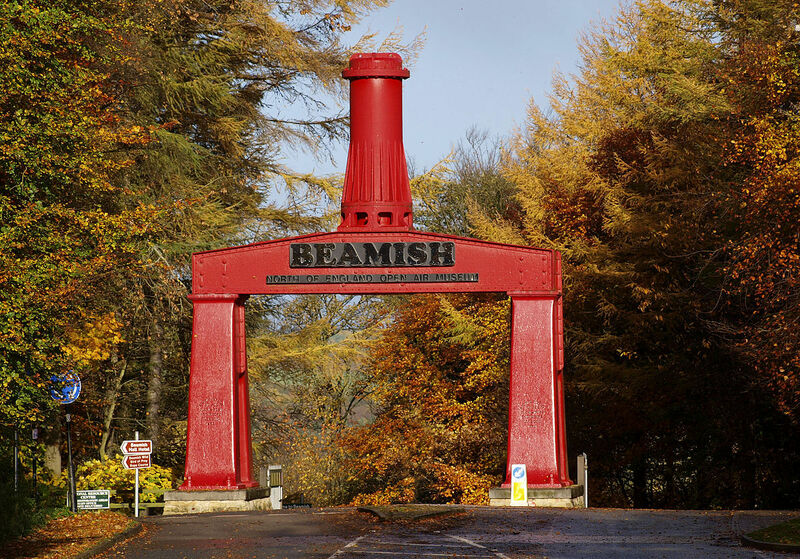 Everyone except me seems to have been to Beamish; it’s on the list (of course!) but, somehow, still to be done. I must say, Millie, that your post and photos show the extent and diversity of it far more than others I have seen – looks simply amazing! Thanks, Mike. I could say the same about visiting some wonderful sites down south. We do tend to head north a lot, or across into Derbyshire. We’ve neglected many of the southernmost counties, other than Cornwall, where we had a week’s holiday last year. I imagine it’s a similar thing with you and the north. I know you’ve spent some time in Yorkshire, and you’ve done posts about Scotland, but places so far from home aren’t those you can have a day out to. As for the number of photos I post… I always tend to ‘overdo’ things, as my ‘almost full’ media file will testify! It’s time to upgrade my site very soon. Beamish is the best of the living museums I’ve been to (although I did enjoy the Black Country Museum in Dudley, West Midlands, too). There is so much to see in a single visit. We were at Beamish for five hours and still hadn’t time to go into some areas, like the mine and pit buildings. Next time, perhaps. This was a fantastic collection of photographs, Millie! I was so excited about the antique items, costumes and memorabilia. I would have to take hours to just see the sights! I love your pics Millie. How beautiful this place is. I would so live to visit there! Thanks for sharing your time there with us. Hm, my computer freaked out there. Let me finish…. I’m so glad you had a Part 2, because I missed Part 1 the first time around and only caught it on Part 2. I absolutely love this place! I could spend a whole day just in one or two of those shops! All those details, wow. I can imagine for someone who writes historical fiction of this time period, what an incredible wealth of information and inspiration this would be. How wonderful that they went to such trouble to put this together, even preserving buildings and then reconstructing them on the new site. And all those vintage signs are amazing! I’ll say it again: squee!